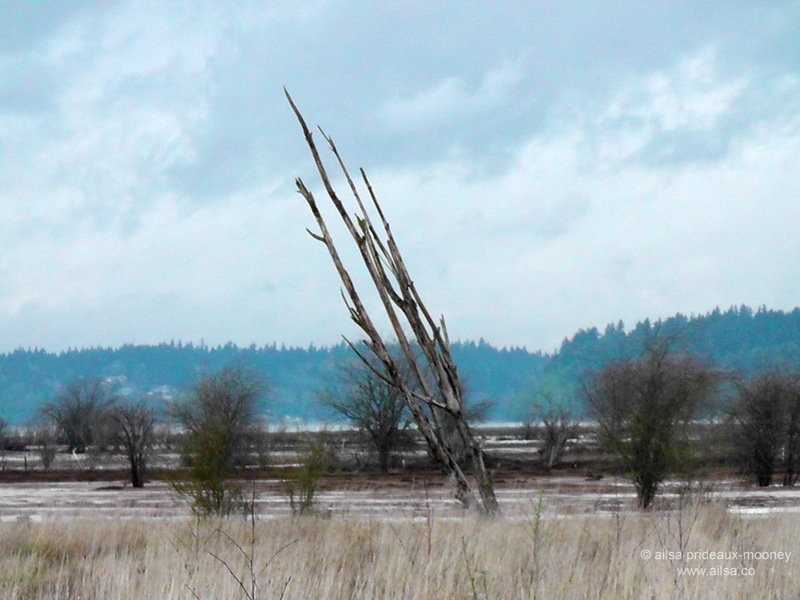 Nisqually National Wildlife Reserve | Where's my backpack? 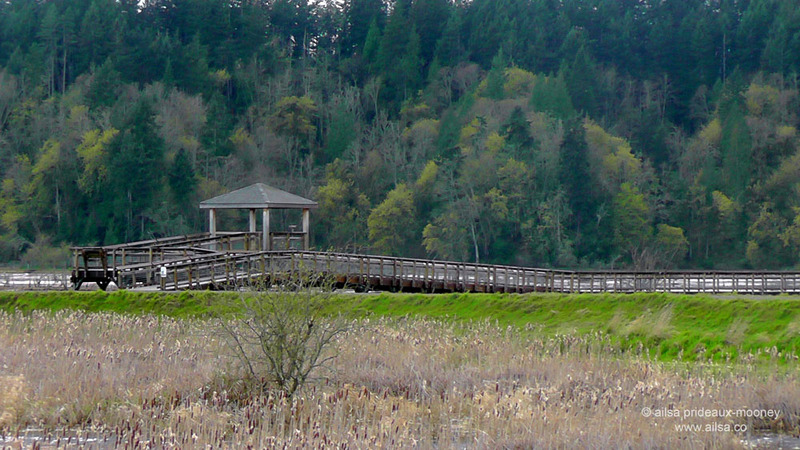 I love the name Nisqually; it’s so much fun to say. 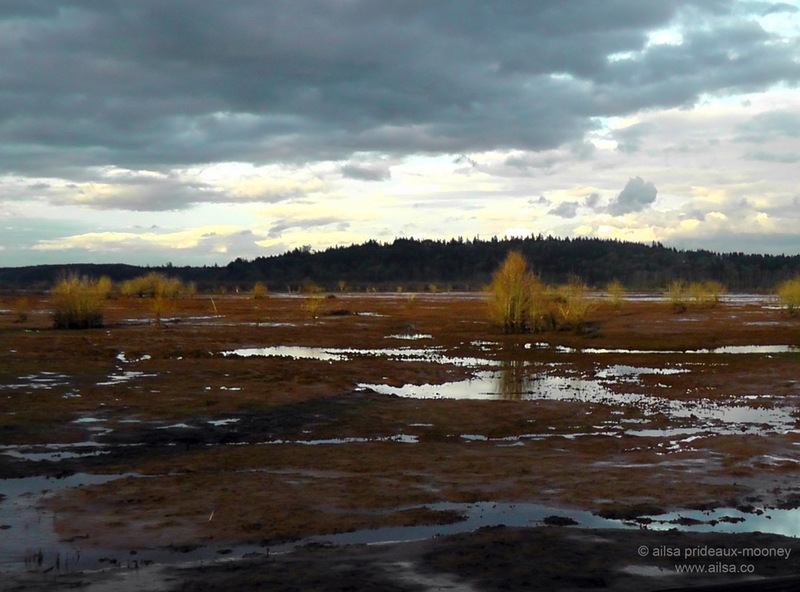 There are varying theories as to where the name originated; the one that makes most sense to me is that native peoples who settled in the Pacific Northwest gave the name ‘squa-squally’ to the low-lying prairie grasses – it actually means ‘prairie grass waving in the wind’. 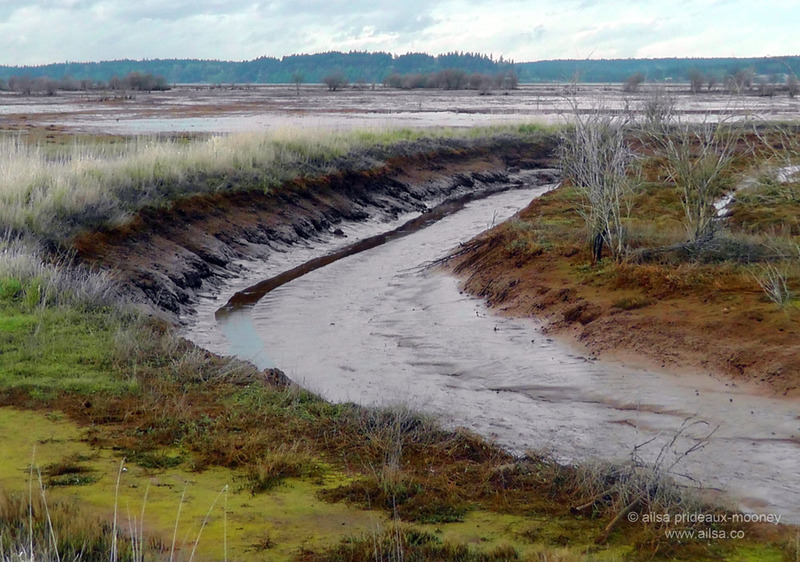 They called themselves Squally-absch, which translates as ‘people of the grassland; people of the river’ and Nisqually is simply an anglicized version. You can’t spend much time in Seattle before hearing the name; the Nisqually Tribe, Nisqually Glacier, Nisqually River, Fort Nisqually and the town of Nisqually. On February 28th 2001 I was standing in the Queen Anne neighbourhood clinging onto my dog, watching the Space Needle sway from side to side as Seattle was rocked by one of the largest recorded earthquakes in Washington State’s history – the Nisqually earthquake. Nisqually is also the name of a national wildlife reserve just a short drive from Seattle and when my road trip pal Sylvia and I decided to escape the city for a few hours, we headed south and promptly got lost. We always do; it’s our modus operandi. Every time we take a wrong turn we complain about how poorly places are signposted, only to discover that we drove straight past a giant sign just a few miles back. 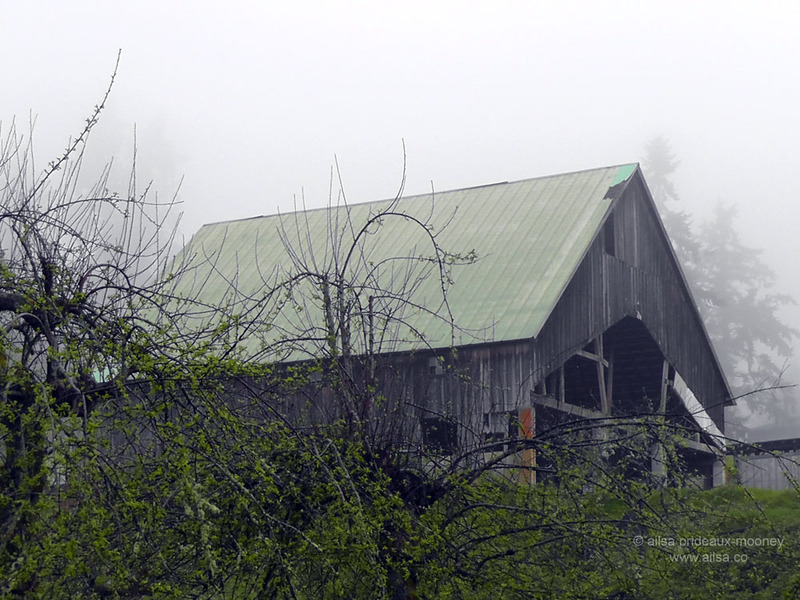 We had already got off to a late start (another trademark of our travels together) so we stopped for a picnic lunch by a misty barn on the wrong road. After eating our fill, we drove back the way we came and found the sign we had haplessly driven past earlier and soon we were on the satisfyingly well-signposted road to the reserve. It was a gloriously foggy, blustery day so we wrapped up and started to explore. Close to the information centre there was a short boardwalk past glittering ponds that reflected the early green of springtime. We followed the trail to the end where we found a sign warning visitors of the aggressive squirrels that frequent the area. Keeping a sharp eye out for any ninja squirrels lurking in the undergrowth or on the branches overhead, we wandered across a dusty path that we guessed might be a trail, so we followed it through fields of corn-coloured grasses with strange, wind-torn trees standing out in sharp relief. 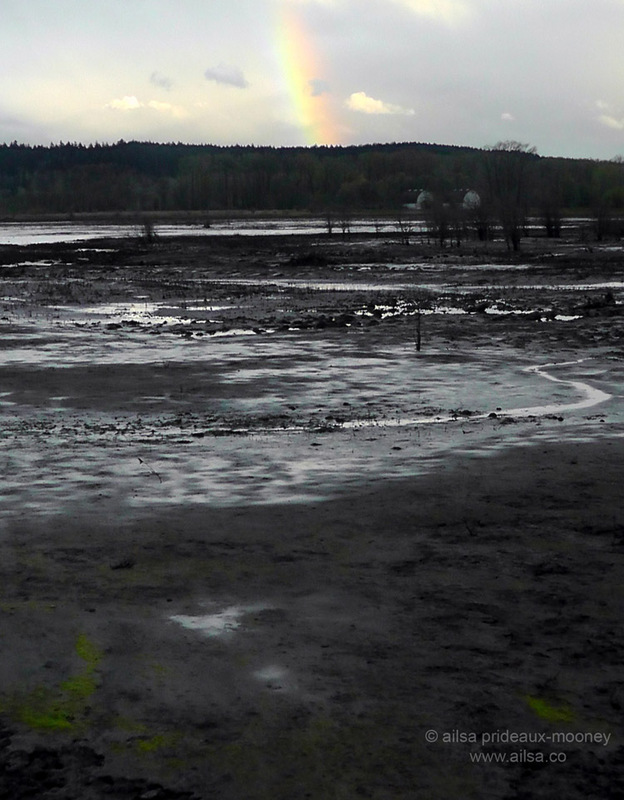 Soon we were in the heart of the Nisqually river estuary and the grasses gave way to water and reeds and thick patches of mud. 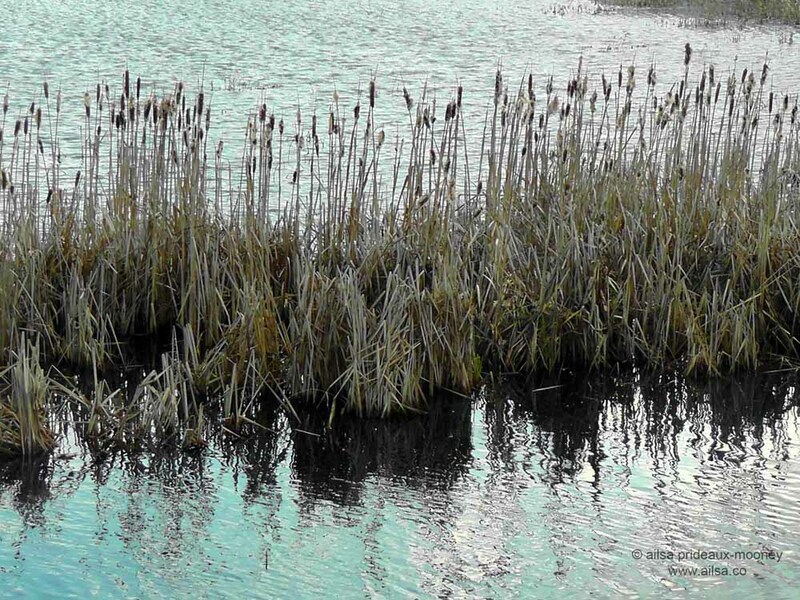 Clouds scudded across the sky and tinged the water icy blue. 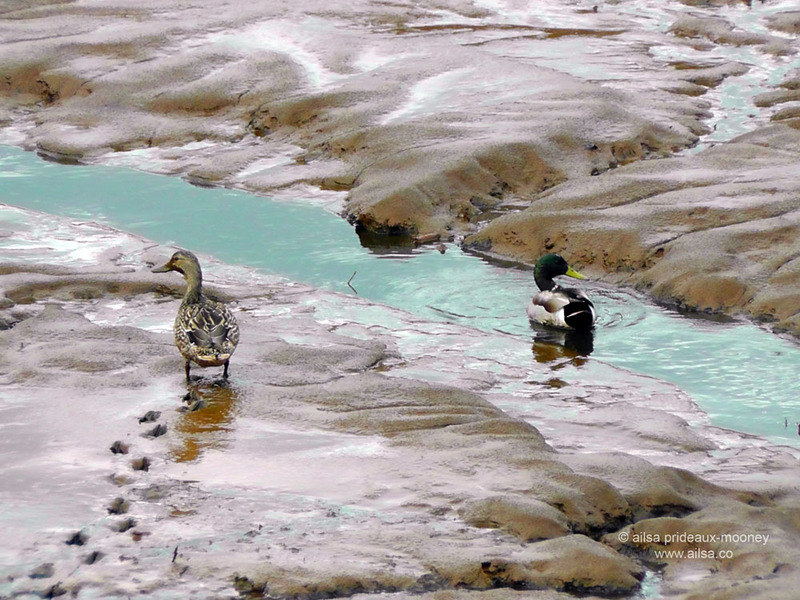 Geese dallied by the water’s edge and ducks squelched and squabbled and left tiny trails of webbed prints in the burnt sienna mud which glowed with an almost metallic lustre. 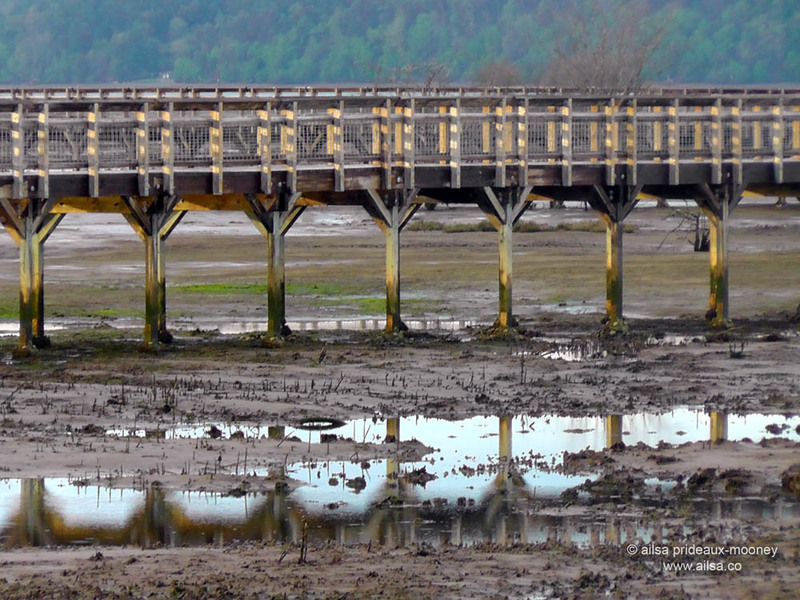 Up ahead we spied a wooden boardwalk leading out across the estuary. The further along the boardwalk we ventured, the stranger the surroundings became until it resembled something closer to a lunar landscape than scenery I would expect to find in the Pacific Northwest. 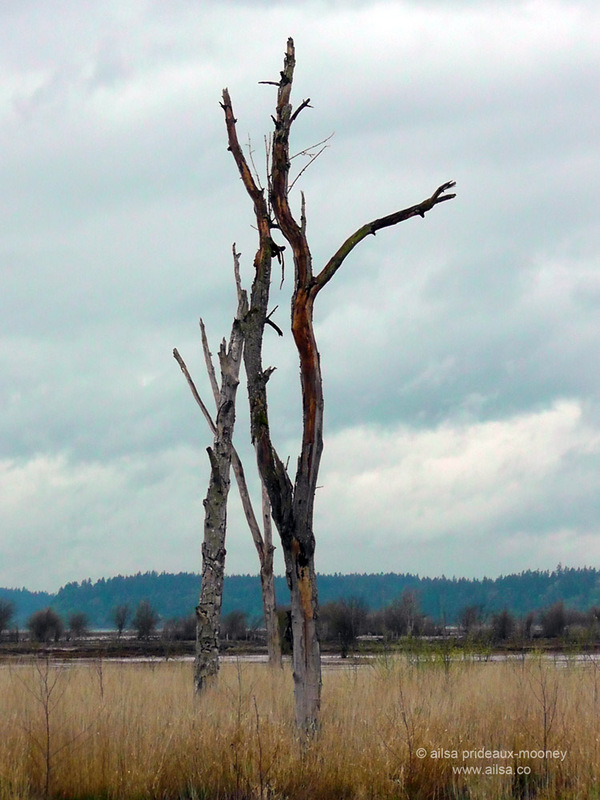 Russet and green gave way to grey and black and bare stumps replaced trees and grasses. 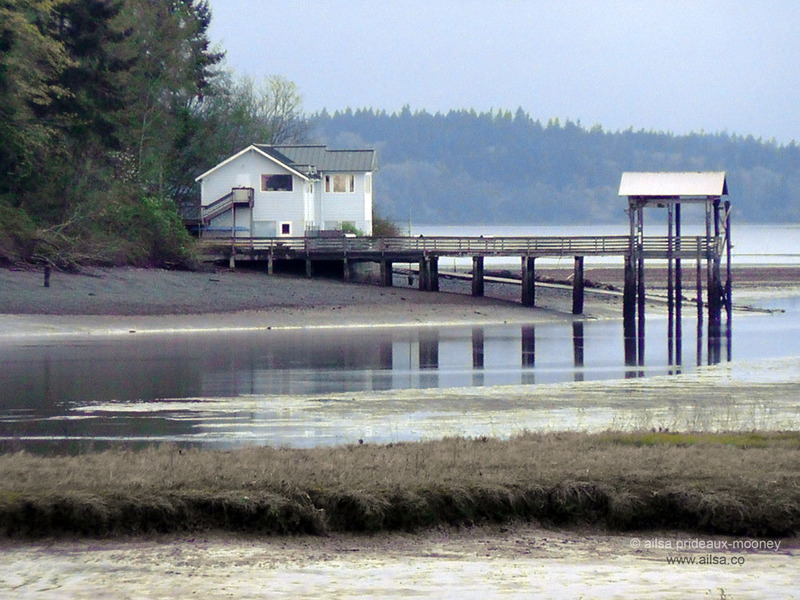 At the end of the boardwalk there was a little lookout with a panoramic view of the estuary. Off in the distance we spotted a house with an equally amazing view. 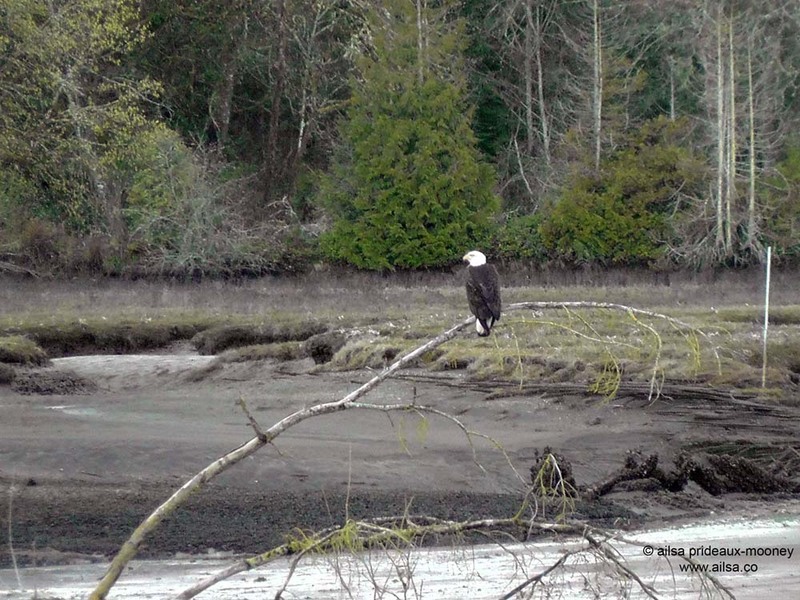 A bald eagle drifted by and perched on a branch just long enough to get a quick photo but not long enough to zoom in for a closeup. As we wound our way back along the boardwalk and back to our truck, a flock of birds swooped overhead as if to bid us farewell. It was the perfect escape from city life. Here’s a short video of our trip. 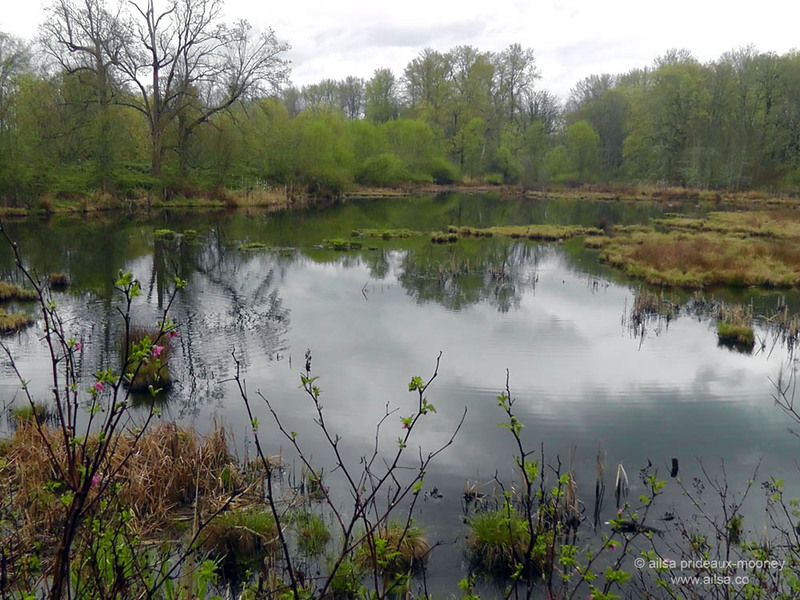 Nisqually National Wildlife Reserve is 8 miles northeast of Olympia, about an hour’s drive from Seattle along I-5 South, unless you take the wrong turn like we did. 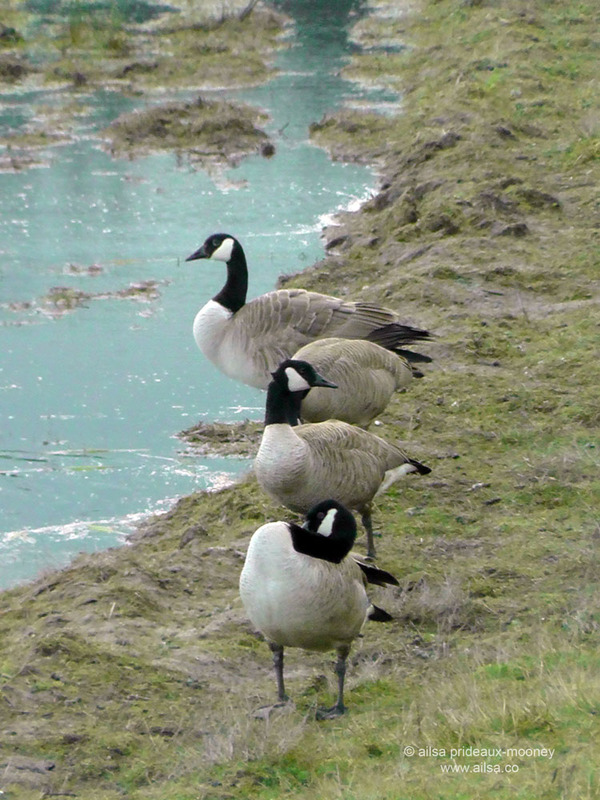 Take exit 114 and turn right to reach the reserve. Turn left to get lost and eat sandwiches in front of a foggy barn. This entry was posted in Photography, Travel, United States, Washington and tagged humor, nature, photography, photos, pictures, travel, wildlife, writing. Bookmark the permalink. I found lots of squ words in your post: Nisqually, Squa-squally, squirrels, squelched and squabbled. I enjoyed reading them, but I’m glad it wasn’t me squishing through the mud. I loved this one and the pictures. Seriously Ailsa, you ‘discover’ the most remarkable places and I thank you for showing them to me with your lovely pictures…..love your descriptive and humorous writing. Lovely post Ailsa! But where are the photos of the ninja squirrels?!?! Ah Tina, that’s the curse of ninja squirrels – you never see them coming! Great post, as always. Tell Jill, I mean Sylvia I am sorry but I am so used to her being Jill I am not sure I can call her Sylvia. This is a beautiful place Alisa, I’m happy to see your pictures today! 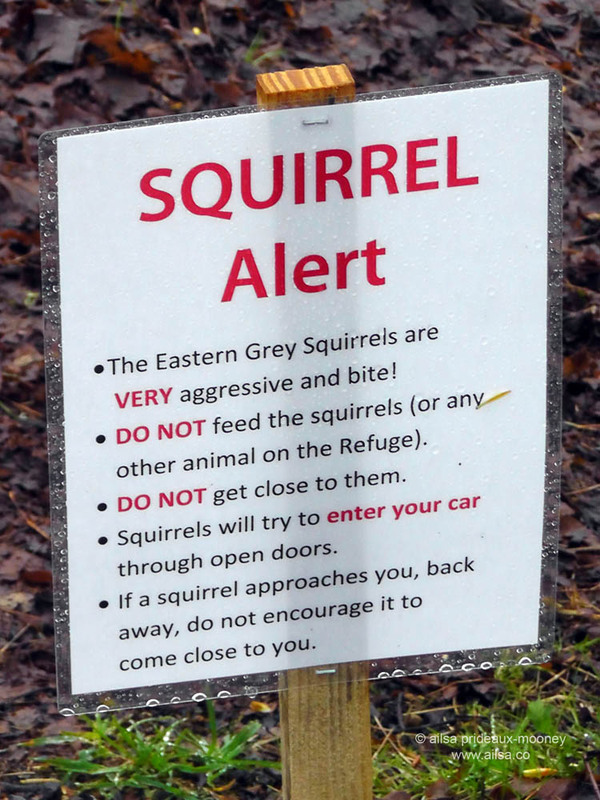 The Squirrel warning cracks me up though… I should post one in my yard! Amazing shots of this special place! Thank you for the beautiful post, Ailsa! Glad you enjoyed it, Amy. It’s absolutely gorgeous; right off the freeway but you would never guess it. We didn’t hear even a suggestion of traffic the entire time we were exploring the reserve. Oh Ailsa, these are beautiful photographs with an equally beautiful written story. Your writing style matched the quiet slowness of the place you were describing. Well done, friend. I enjoyed your story and the way you laced your photos in amongst the story line. I have a request. I would like permission to use your squirrel sign in an up and coming post.. . I have a similar writing style, so OF COURSE I enjoyed reading your entry! Good tempo and visuals to bring it to life! Pingback: Travel theme: Wild | Where's my backpack? 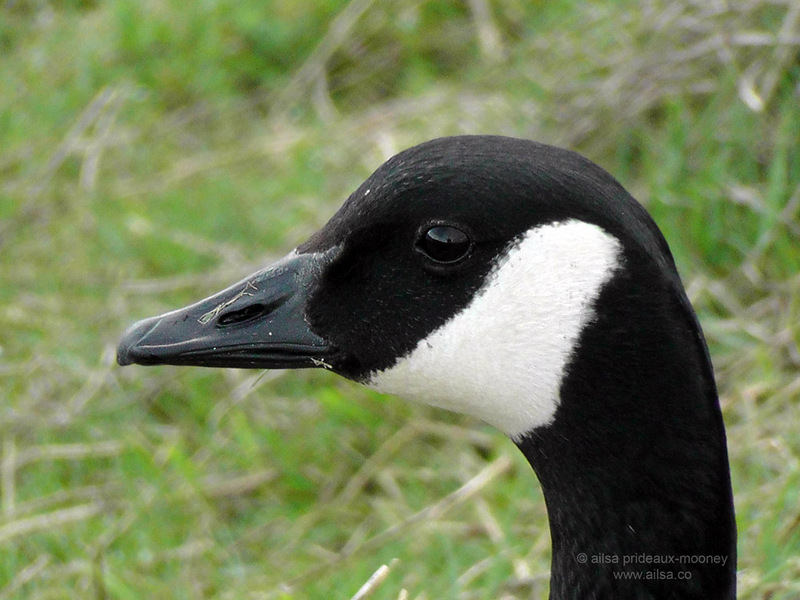 Ailsa, your nature photography continues to amaze and delight! Many thanks!